Reference number for this case: 14-oct-54-Saint-Ambroix. Thank you for including this reference number in any correspondence with me regarding this case. NIMES, [?]. - Several hunters in the commune of Saint-Ambroix (the Gard), recently saw seven tiny beings whose shape vaguely reminds that of a human being. When they tried to approach, the beings rushed towards a phosphorescent machine which flew away at once. At the place where the pilots of the flying saucer had been, the hunters discovered on the ground a number of seeds of bizarre appearance; which they had examined by seeds resellers. The latter found it impossible to classify them into a known species. Nimes. -- Several hunters of the municipality of Saint-Abroix (Gard) recently found seven tiny beings whose shape was vaguely reminiscent of a human body. When they tried to approach the beings rushed to a phosphorescent craft, which immediately flew away. At the location where the pilot of the flying saucer had been, the hunters discovered on the ground a number of seeds of a weird appearance, that they had examined by seed dealers. They found themselves unable to classify them in a known species. On the other hand, a development was just made today by a person, about the "saucer" which was seen above the area of St Andre, at the limit of the department of the Eure and the Eure-et-Loire, Saturday towards 06:30 p.m.
Several hunters of the commune of St Ambrois (Gard), are said to have recently seen seven tiny beings whose vaguely reminded of that of a human body. When they tried to approach, the beings rushed towards a phosphorescent machine which flew away at once. On the site where the pilots of the flying saucer had been, the hunters discovered on the ground a certain number of seeds of weird appearance which they hade examined by seeds resellers. Those were unable to classify them in a known species. Michel Carrouges lists as a case with small occupants but lacking details that with hunters of Saint-Ambroix in the Gard as witnesses, on October 14, 1954. He says that there were allegedly seven small beings but no details are available about them. Oct. 14, 1954 Saint-Ambroix (France). Several witnesses saw seven small beings flee into a phosphorescent object when they were approached. It took off immediately. It is claimed that "unknown seeds" were found at the site. (62) (La Croix, 16 oct. 1954). 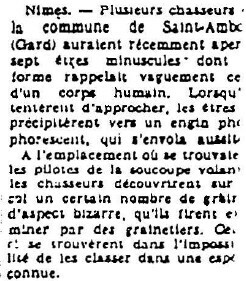 The author indicates that on October 14, 1954, in Saint-Ambroix in the Gard, several witnesses saw seven small beings which fled in a "phosphorescent" object when they approached. The object flew away immediately. This ufologist indicated in a listing of cases of "not admitted to classification" CE3, that the case No. 27 of 10/14/54 in St. Ambroix in the Gard in France with hunters as witnesses is to be classified as "imprecise source" or "with insufficient investigation." 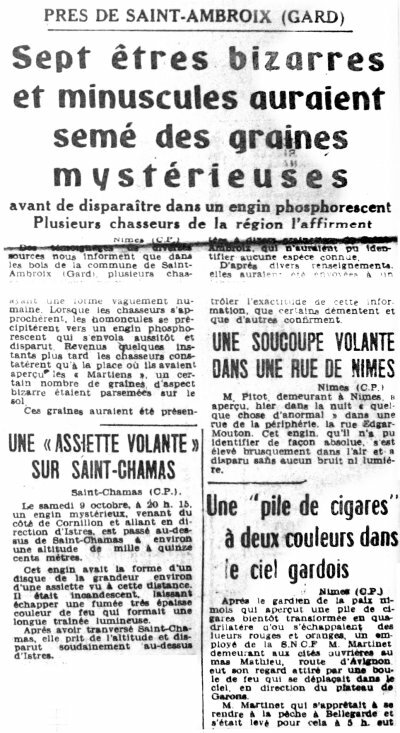 The author indicates that on October 14, 1954, in Saint-Ambroix in the Gard, several witnesses saw seven small beings who fled into a "phosphorescent" object when they approached. The object flew away immediately. This author indicates that the case was "a prank organized by the hunters." "Several hunters see seven tiny beings, of humanoid aspect. They try to approach them. But the beings rush towards a phosphorescent machine which flies away at once. The hunters immediately look for traces. They do not find any, but discover odd seed species, which they have examined with seed experts. The experts were unable to identify them." "Is it necessary to conclude from this strange encounters that the hunters disturbed an horticultural commando with a mission to test the acclimatization on our ground of seeds from another planet?" Press, newspaper at the time headlined "Snowy White and the Seven Dwarves". Prank by the hunters narrated in "INFO OVNI" N.0: "the rabbit and the fox" and "OVNI" p. 669-670. LDLN #249-250 p. 2. "Seven weird and tiny beings are said to have sown mysterious seeds - before disappearing in a phosphorescent craft. Several hunters of the area claim this." "Nimes (C.P.) Testimonys of various sources inform us that in the wood of the village of Saint-Ambois (Gard), several hunters are said to have seen, several days ago, seven beings minusculs having a vaguely human appearance. When the hunters approached, the homonculuses rushed towards a phosphorescent craft, which immediately flew away and disappeared. Back a few moment later, the hunters took notice that in the place where they had seen the "Martians", a certain number of seeds of weird aspect strewed the ground." "These seeds are said to have been shown to various seed-sellers of Saint-Ambroix, who could not identify any known species." "According to various information, they have been sent to a laboratory for expertise. It was impossible to us to control the authenticity of this information, that some deny and others confirm." The two authors indicate that "this parody had been invented by some inhabitants of the locality." They specify that a collaborator of the Association of the Friends of Marc Thirouin (AAMT, a ufology association), at the time of a re-investigation, "had already smelled a hoax." In his 1997 book on the 1954 French flap, UFO researcher and author Jean Sider exerts his wit against debunkers Barthel and Brucker. Indeed, the two infamous debunkers authored a book of which they claimed to explain cases so far unexplained. However, Sider notes, this case waa already explained long ago: two days after the story broke in the national Press, the "Midi Libre" regional newspaper for October 16 admitted that the story was nothing but a joke played by a seed reseller and some friends. Sider adds that a private ufology group called A.A.M.T also made it clear in 1970 that the story has no other nature than that of a joke. So, asks Sider, why do the two debunkers bring the already explained case back to life? Godelieve van Overmeire indicates that in 1954, on October 14, in France, in St Ambroix, several witnesses saw seven small beings which fled in a phosphorescent object when they approached. It took off immediately. It is said that one found unknown seeds at this site. The sources are noted "La Croix, 16 oct 1954" and "Jacques Vallée: 'Chronique des apparitions ET' - DENOEL 1972 - J'AI LU COLL. - p. 279, 280". She indicates that another version is: "In reality: hoax performed by the hunters." The source for this is given as "Erich ZURCHER: 'Les Apparitions d'Humanoïdes' - Alain Lefeuvre pub. 1979, p. 181,182". + 7 figures. A journalistic prank / Samedi Soir. Several witnesses saw 7 small beings flee into a phosphorescent object when they were approached. It took off immediately. It is claimed that "unknown seeds" were found at the site. No other information. In Saint-Ambroix (France), several witnesses see 7 small beings which fled in a phosphorescent object when they approach. It takes off immediately. It is said that one found unknown seeds on this site. Jérome Beau indicates as sources "La Croix, October 16, 1954". The website indicates that on 14 October 1954 at 21:00 in St Ambroix, France, "Several witnesses saw 7 small beings flee into a phosphorescent object when they were approached. It took off immediately. It is claimed that 'unknown seeds' were found at the site. No other information." Donald Johnson indicates that on October 14, 1954, in southeastern France "several witnesses in Saint-Ambroix, Gard, France saw seven small beings flee into a luminous object when they were approached. It took off immediately. It was claimed that 'unknown seeds' were found at the site". The sources are indicated as Jacques Vallee, Passport to Magonia: A Century of Landings, case # 250; Michel Carrouges, Les Apparitions de Martiens, p. 104. Vallee case 250, citing La Croix 16 Oct 1954. The author reports as an anecdote that near Saint-Ambroix, in the Gard, on October 14, 1954 at an unknown hour, in the woods of the commune, several hunters saw seven tiny beings having a vaguely human form. When the witnesses approached, the homunculites rushed to a phosphorescent machine that flew away and disappeared. A number of seeds of bizarre appearance were then found on the site and the seeds resellers were unable to classify them in a known species. He indicates that the sources are C. Garreau and R. Lavier, in "Face aux Extra-Terrestres", page 119; Le Provençal for October 14, 1954; La Dépêche du Midi for October 15, 1954; La Croix for October 16, 1954. He explains that in reality it was a hoax, and that the newspapers of the time titled "The Seven Motorized Dwarfs of Snowy White", "Is Snowy White Martian? Bizarre appearance fly in a phosphorescent machine near Nimes." He indicates that as of October 16, 1954, Le Midi Libre admitted that it was a hoax by a seed reseller and some of his hunters friends; which did not prevent ufologists like C. Garreau and J. Vallée to note this fanciful case in their catalogs. He indicates as source for the explanation Michel Figuet and Jean-Louis Ruchon, in "OVNI: Le Premier Dossier des Recnontres RapprochéEs en France", pages 669-670; Eric Zurcher, in "Les Apparitions d'Humanoides", pages 181-182. Several witnesses saw 7 small beings flee into a phosphorescent object when they were approached. It took off immediately. It is claimed that “unknown seeds” were found at the site. No other information. *Oct. 14, 1954 - Several witnesses including one named Chasseurs in Saint-Ambroix, Gard department, France saw seven small beings flee into a phosphorescent object when they were approached. It took off immediately. It is claimed that "unknown seeds" were found at the site. (Sources: Jacques Vallee, Passport to Magonia: A Century of Landings, case # 250; Michel Carrouges, Les Apparitions de Martiens, p. 104). 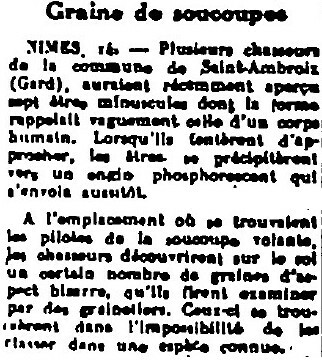 The author indicates that there was a false close encounter of the third kind near Saint-Ambroix, the Gard, on October 14, 1954 at an unknown hour. In the woods of the commune, several hunters saw seven tiny beings with a vaguely human form. As the witnesses approached, the homunculus rushed to a phosphorescent machine that flew away and disappeared. A number of bizarre-looking seeds were found at the site and the seeds resellers were unable to classify them in a known species. The sources are indicated to be C. Garreau and R. Lavier, "Face aux Extra-Terrestres", page 119; Le Provençal for 14 October 1954; La Dépêche du Midi for 15 October 1954; La Croix for 16 October 1954. Julien Gonzalez says that in reality it was a hoax. The newspapers of the time had titled "The Seven Motorized Dwarfs of Snow White", "Is Snow White Martian? Seven dwarves of bizarre appearance fly in a phosphorescent machine near Nimes." As early as October 16, 1954, Le Midi Libre admitted that it was a prank mounted by a seiner and some of his hunters friends. This did not prevent ufologists like C. Garreau and J. Vallée from recording this fanciful case in their catalogs. He indicates that the sources of the explanation are Michel Figuet and Jean-Louis Ruchon, "OVNI: le premier dossier complet des rencontres rapprochées en France", pages 669-670; Eric Zurcher, "Les apparitions d'humanoïdes", pages 181-182. "The weekly magazine "Samedi Soir" subsequently explained that it had just been a journalistic prank (to check.) It seems more obvious that it was a prank by the hunters (the "unknown seeds" examined by "seed experts" all so unknown.)" FRANCAT confirms my impression that it was a prank by the hunters themselves. FRANCAT dates the case of the 13th and not the 14th. November 25, 2004: I read about the case in Jean Sider's book, see above. Now two more sources, (unless disproved) including a newspaper of that time, confirm the hoax. However, not as a hoax of the Press, but much simply a hoax by a seed reseller and some friends (the hunters?). Later I managed to locate the writings of Gerard Barthel and Jacques Brucker. As often - though not always - in their research on the 1954 saucer stories, it seems that Gerard Barthel and Jacques Brucker did not consider useful to give the least precision concerning their explanation of the story as an invention, the sentence "this parody had been invented by some inhabitants of the locality" being the total of what they provide as explanation. They indicate that someone else "had already smelled the hoax" but actually I feel like suspecting that they know nothing precise about the circumstances of the hoax and simply issue an opinion without risk since a counter investigation of someone of the AAMT had done the work previously. [cn1] Article in the regional newspaper La Croix du Nord, France, October 15, 1954. [---] Article in the regional newspaper La Dépêche du Midi, Marseille, France, October 15, 1954. [cm1] Article in the regional newspaper Centre-Matin, France, October 15, 1954. [---] Article in the regional newspaper Midi Libre, France, October 16, 1954. [qh1] Article in the regional newspaper Le Quotidien de la Haute-Loire, France, October 16, 1954. [---] Article in the "Samedi Soir" magazine. [mc1] "Les Apparitions de Martiens", book by Michel Carrouges, (aka Louis Couturier), Fayard publisher, France, page 104, 1963. [gl1] "Face Aux Extra-Terrestres", book by Charles Garreau and Raymond Lavier, Delarge publisher, France, pp 123-124, 1975. [---] A.A.M.T. ufology group, 1970. [cb1] "En Quête des Humanoïdes", book by Charles Bowen, French version of "The Humanoids", J'ai Lu publisher, France, page 54, 1974. [jp1] "Liste des cas d'observation d'occupants (suite)", by Jader U. Pereira, in the ufology magazine Phénomènes Spatiaux, GEPA ufology group, France, #29, page 25, September 1971. [ez1] "Les Apparitions d'Humanoïdes", book by Erich Zurcher, Alain Lefeuvre publisher, France, pp 181-182, 1979. [---] Article in the ufology magazine "Lumières dans la Nuit" #249-250, page 2. [---] "Le Lapin et le Renard", article in the ufology bulletin "INFO OVNI" #0. [bb1] "La Grande Peur Martienne", book by Gerard Barthel and Jacques Brucker, Les Nouvelles Editions Rationalistes éditeurs, page 85, 1979. [fr1] "OVNI, Premier Dossier Complet des Rencontres Rapprochées en France", book by Michel Figuet and Jean Louis Ruchon, Alain Lefeuvre publisher, France, pp 669-670, 1979. [ge1] "Méthodologie d'un Problème: Principe & Applications (Méthodologie - Isocélie - Information)", Technical Note #3, by the Groupe d'Etude des Phénomènes Aérospatiaux Non Identifiés (GEPAN), of the Centre National d'Etudes Spatiales (CNES), France, page 48, April 1981. [js1] "Le Dossier 1954 et l'Imposture Rationaliste", book by Jean Sider, Ramuel publisher, France, page 67, 1997. [jg1] "RR3 - Le Dossier des Rencontres du Troisième Type en France", book by Julien Gonzalez, Le Temps Présent publishers, France, page 438, 2014. [gz1] "RR3 - Le Dossier des Rencontres du Troisième Type en France", book by Julien Gonzalez, Le Temps Présent publishers, France, page 438, 2014. 0.1 Patrick Gross May 14, 2003 First published. 1.0 Patrick Gross April 8, 2009 Conversion from HTML to XHTML Strict. First formal version. Additions [go1], [jb1], [ud1]. 1.2 Patrick Gross March 9, 2010 Addition [ge1]. 1.3 Patrick Gross June 28, 2010 Addition [jv5]. 1.4 Patrick Gross July 27, 2010 Addition [lp1]. 1.5 Patrick Gross August 17, 2010 Addition [vm1]. 1.6 Patrick Gross August 14, 2013 Addition [pr1]. 1.7 Patrick Gross September 17, 2014 Addition [cm1], [lh2], [ta1], [ni1]. 1.8 Patrick Gross December 28, 2016 Additions [cn1], [jp1], [jg1], [ub1]. 1.9 Patrick Gross February 20, 2017 Addition [gz1].